Miscellaneous Monday: Stop Looking Homeless!! One garbage day morning, I woke later than expected. Worse still, I woke to the sound of a garbage truck closing in on my block. With the quandary of what to do with unpicked up trash lighting a fire under my bum, I threw on the pants and jacket I found on the bench at the foot of my bed, bypassed all inferior trash for the perennially stinky money bag that is the kitchen trash, and headed for the door. In the end, I made it to the curb. But, in the midst of my success, I had also managed to do something quite heinous. I walked out of a home, where I (a home-ful person) live, looking quite homeless. And this isn’t me being facetious. This was me on Triumphant Garbage Day: Hair fighting atop my Zapzyt dotted face, a black waist-length motorcycle-style jacket, a knee-length oversized pink Winnie the Poo Shirt (it was a gift, no one knows why I kept it), sky blue patterned pajama pants, and black rain boots. The moral of the story: Fair Lady needs a robe (among other morals which will probably be revealed to me as time passes). The problem is that I hate robes from an aesthetic point of view. The robes I frequently encounter are utilitarian: straight, unflattering lines, boxy pockets . . . bleh. Enter McCall’s 5989. I love ruffles so I was drawn to and torn between McCall’s 5989A and Butterick 5723A. But the shorter sleeves and longer ruffles on 5989 won me over. Sidebar: I also bought Butterick 5571 just in case the ruffles didn’t pan out. So far, things are working out dandy . 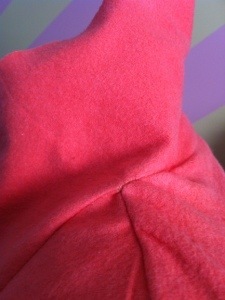 . . well, except for one little construction issue: the point where the collar joins the shoulder. What’s happening right there? I fumbled with it for hours and that’s the best I could do. And hey, McCall’s, if a pattern is labeled easy, might be nice if the instructions were thorough. Whatever. That’s the collar up appearance. Collar down–and collar will be down–no one will know. Normally this would be one of those imperfections that would cause me to throw this whole project out. However, when weighing crazy shoulder seams against waist length jackets atop oversized threadbare Pooh shirts, well . . . collar down. If all goes well, I can be properly attired before next garbage day. 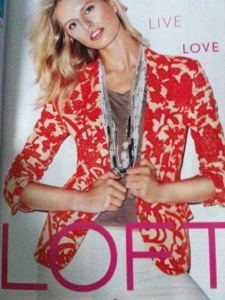 Until then, bask in the glory that is this Ann Taylor Loft jacket. Sigh, I want, I want. Of course, since I don’t want to run into anyone wearing my jacket, I can’t buy it. Also, I couldn’t find it on the Loft’s website. Nevertheless, it’s a peach. One day I’ll make a jacket like it and this thing, it will be a thing of magnificence.